Perspective drawing is one of the three fundamental skills of drawing—right up there with drawing edges and negative spaces Done right, you can use the measurements and geometric rules to create an illusion of depth and distance. If you ignore it—or you just don't know how to do it—your painting will not be convincing. Perspective drawing in art considers that objects appear to get smaller as they recede into the background. The word “perspective” means 'to look forward' in Latin. To a viewer, an object actually shrinks by half in size each time the distance to it is doubled—something our eyes and brain use every day to decide where we are in relation to our surroundings. 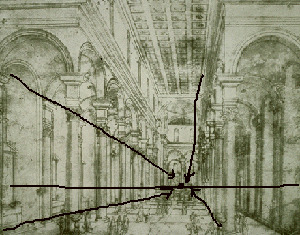 The rules of perspective drawing were 'invented' in early Renaissance Italy. There are three different types of perspective in art-geometric perspective, linear perspective, and aerial perspective. Geometric perspective drawing is useful for architectural and mechanical drawings, but I would reserve it for purely technical work. This approach results in images that appear rigid and mechanical. If you go strictly by geometric perspective rules, you will end up with...well, a mechanically impressive drawing, but lacking artistic flavor. As an artist, you only have to concern yourself with the less exacting linear and aerial perspective drawing. In linear perspective you learn to use such things as one point, 2 point perspective, and 3 point perspective. In aerial perspective, the distant objects or spaces appear less sharp (or blurry) because of dust and water vapor in the air; as a result distant objects exhibit less contrast. Aerial perspective is particularly used in art involving landscapes. Linear perspective is common in art with buildings or other structures. You can find this type of perspective everywhere in daily life. A kitchen corner, a porch, a balcony, the view of the street corner as you sit in your car...just looking down the hallway in your home will show you a one point perspective. Take a look at the drawing of Church Santo Spirito by Italian Renaissance artist Brunelleschi. This drawing is a great example of one point perspective: all straight lines going into the painting point toward a vanishing point on the horizon. Objects of the same length and width decrease in height and size as they approach the line of the horizon. One important point to remember is that, as an artist, when you use one point perspective, you must establish a fixed point of view (you can call it a station point). If you change your eye level by moving up and down, the entire drawing will need to be adjusted. To draw one point perspective, pick a view and then select your station point. Without turning your head to either side, look straight ahead. Make note where your eyes naturally land on a wall or other surface behind all of the objects you will be drawing. Again, keep your head steady, as your drawing will not be accurate if you move around. 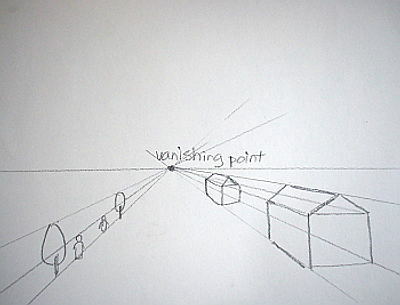 Find your vanishing point (I call it the eye point sometimes) at the end of the path directly away from your eyes. If you are indoors, it can somewhere on the wall—the spot farthest from you. Outdoors, it will be on whatever your eyes come to rest on in the distance. If it the view is fairly open, it may be on the horizon. Outdoors, it will be on whatever your eyes come to rest on in the distance. If it the view is fairly open, it may be on the horizon. 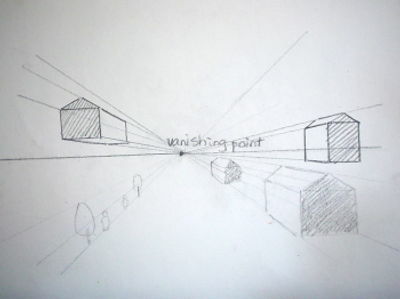 Once you have found your vanishing point, your horizon line extends (horizontally, of course) to the right and left of it on your drawing surface and beyond. Try to identify an object in your field of view which has a flat surface that faces you directly. If there isn't one, you may want to pick a different view (for this exercise) or you can “imagine” a fictitious surface. However you do it, draw that flat surface. Any and all straight lines connected to that surface which point either toward or away from you should point toward or away from the vanishing point (the “eye point”) in your painting. This first surface can now be used as a reference, and you can use it to guide the placement of anything else you wish to have in your drawing—as long as you have your vanishing point fixed in the same spot. The spreading of lines as they approach or move away from the vanishing point show you how to scale objects that are further away or closer to you. The same lines also indicate how to place objects in front of or behind others. Now you can move on and find out you can draw 2 point perspective, too. 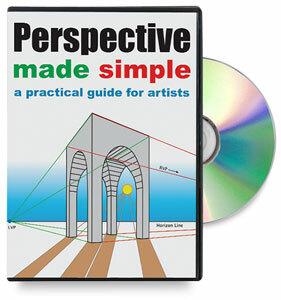 And to expand your horizon further, find out what is 3 point perspective and how to draw it. Learn more about perspective and bring your art to a higher level.